We took a quick ride over to Richards Lake in Carrollton yesterday to see what we could find in the water. It turns out there was more there than we thought there might be. 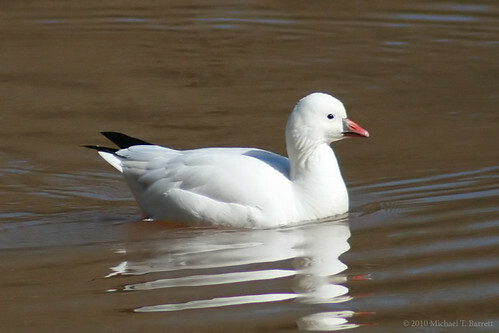 We spotted 18 different species of birds, one of which was the Ross’s Goose. We also saw a couple Common Mergansers, but after a return trip today to confirm that sighting, we were unable to relocate them. When we spotted them on the lake they were ovre by the dam, and we were sitting in the truck on the road. The sun was reflecting off the water, and we could not get a verifiable photograph, although we did enjoy the view for several moments with the binoculars (until a car pulled up and quickly reminded me we were on the road). On our return trip today we were greeted by a well-meaning but gruff security guard who actually tried to imply that the road crossing the lake (on which we were standing) was private property. Rather than get into a nasty argument with the guy, we left. We’ll head back over there in the next couple days to see if the Common Mergansers show up again. While some birds avoid people at all costs, some, like that Great Blue Heron, were oblivious to our being there. We watched him for several minutes before we realized he was not a statue. All in all, it was another great weekend. Now if I could just kick this headache that started tonight. That Ross’s Goose is a great find Michael! 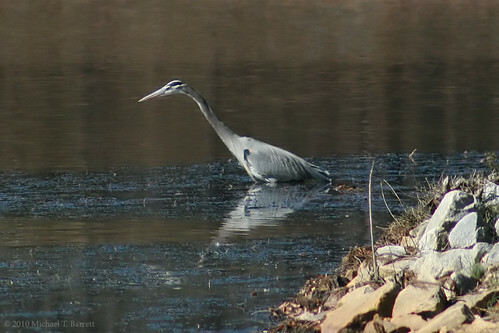 I used to have a resin GB Heron in my pond. It fooled a lot of people! Good luck with the headache, I know what you’re going through!